This Republic Day, let your smokey eye look represent celebrations and a true patriotic spirit! This Republic Day, showcase your patriotic spirit with the help of your outfit and makeup. Most often, people tend to only wear saffron and green colored outfits for Republic Day celebrations. But how about adding another dazzling element to the whole style? To help you out, we came up with this amazing smokey eye look that you can try to shine at the Republic Day events this year. This entire look is inspired by the Republic Day celebrations. We are going to show you a step by step guide to do an orange smokey eye makeup that you can team up with a saffron and green outfit. When you are finished, no one will be able to keep their eyes off you wherever you go. So take a look, and become the new fashion icon among your peers this year, and show off your patriotic style with pride. Start with your basic foundation and use a concealer to cover blemishes as well as dark circles around the eyes. You don’t want your fantastic look marred by the presence of dark marks around the eyes. Once you have hidden the dark circles, apply a generous coat of primer all over the eyelid. This helps to keep the eye shadow in place and even prevents creasing on and around the eyelid as you apply the makeup. You can use a blending brush or use your finger to completely blend in the primer. Start by applying a champagne or light golden shade of eye shadow along the lower lash line up till the crease of the eyelid. Blend it in well and touch it up with some more eye shadow if needed. 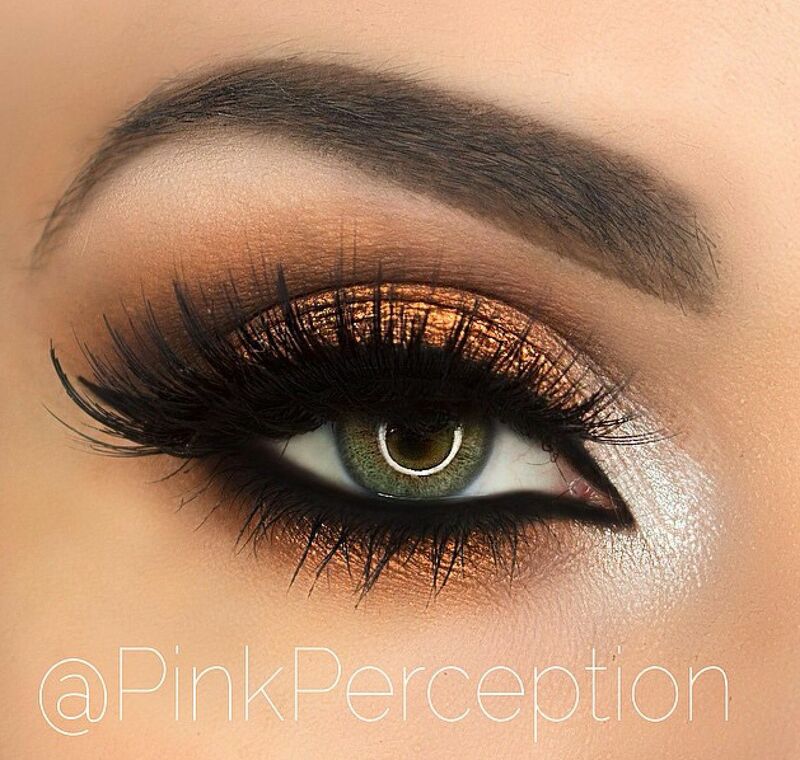 This color helps to brighten up the eye and prevents the look from appearing too dark. Use an eye shadow brush and taking some of the orange eye shadow apply it all over the crease and blend it out towards the outer corner of the eye. Blend it in an upwards movement, moving from the crease towards the brow bone. Now use a medium brown shade (you can also use a darker brown shade if you want a more dramatic look) and apply it on the outer half of the eyelid. Blend it in with the orange eye shadow at the outer corner of the eyelid to give it a smokey effect. Now to add a bit of that sizzling desi style, line your eyes generously with kajal. Apply a thick stroke on the upper lash line and fill up your lower waterline as well. If you have small eyes that look droopy with too much kajal, try tight lining your eyes instead to open them up more and still create a dramatic effect. You can even try a winged eyeliner look with this style. Top off the look with fake eye lashes or load up plenty of mascara after carefully curling your lashes. Fill in your eyebrows to cover any bald spots. Wear your favorite saffron and green outfit and your Republic Day inspired look will be all set.